This is a sponsored post from Acorn Network on behalf of Progresso Rich and Hearty Chicken and Homestyle Noodle Soup. As always, all opinions are 100% mine. I wanted to get a little creative today and add a fun twist to our “soup night.” Walmart had everything I needed to make this fun and delicious fall dinner. 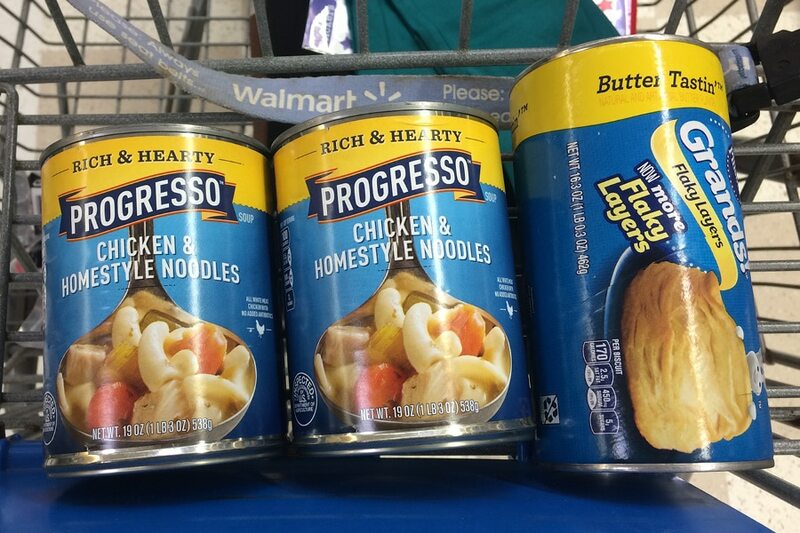 Progresso Rich & Hearty Chicken & Homestyle Noodle soup has all white meat and it is antibiotic free. 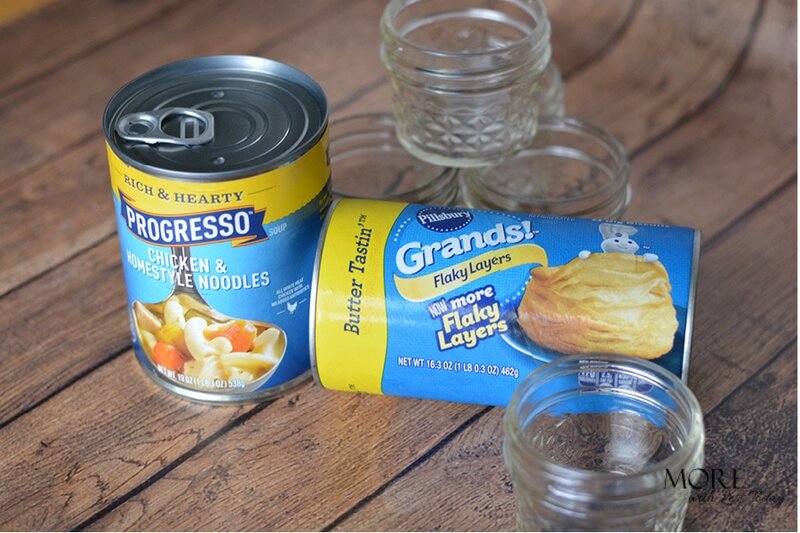 It is one of my pantry staples, especially when the weather turns cold here in Michigan. Walmart is a one-stop shop for me. I can get my groceries household supplies and more, all in one trip and all at the very best prices. I used 4 ounce jelly jars/canning jars. Use caution, you need to make sure you are using food and oven safe jars or a ramekin dishes. You also don’t use the lids or the rings of the canning jars. Preheat oven to 350. Line a baking sheet with parchment paper and place 8 jars onto the paper. Heat soup according to package directions using the microwave or stove top. Divide soup among 8 small jars and fill about 1/2″ from the top. Place one biscuit on top of each jar. Bake for 13-16 minutes (according to package directions) until golden brown. 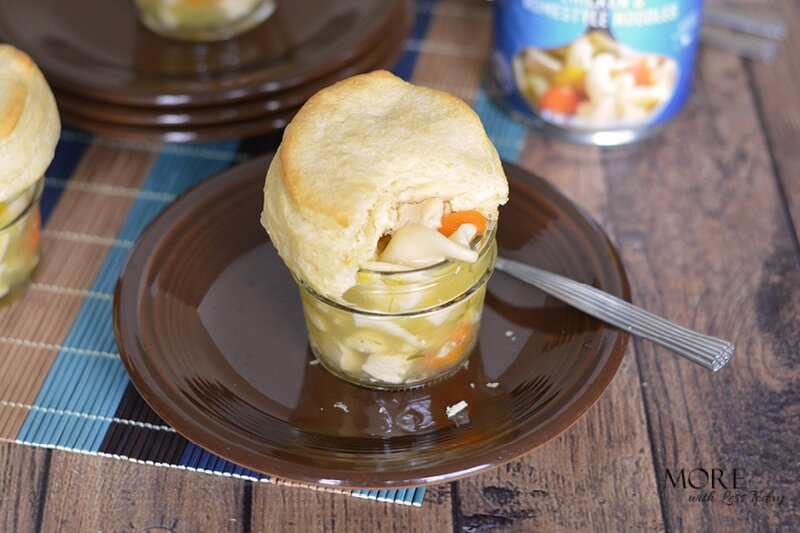 Your family or dinner guests will love these small chicken noodle soup and biscuit meals. Divide soup among 8 small jars and fill about ½" from the top. This is the perfect weather for this recipe. It looks so delicous and easy to make. I am sure it will be a hit with my family. That looks like a really hardy meal! I love how creative it is!! I can’t wait to show my family!! Yum. Progresso is one of my favorites. Takes right back to being a kid. My granma always has their chicken noodle soup on hand. Yes! I live in Georgia,so you had me at biscuit topper. I can’t wait to make this. Yum! That is such a good idea! I love the way that looks, I am going to have to try this out! 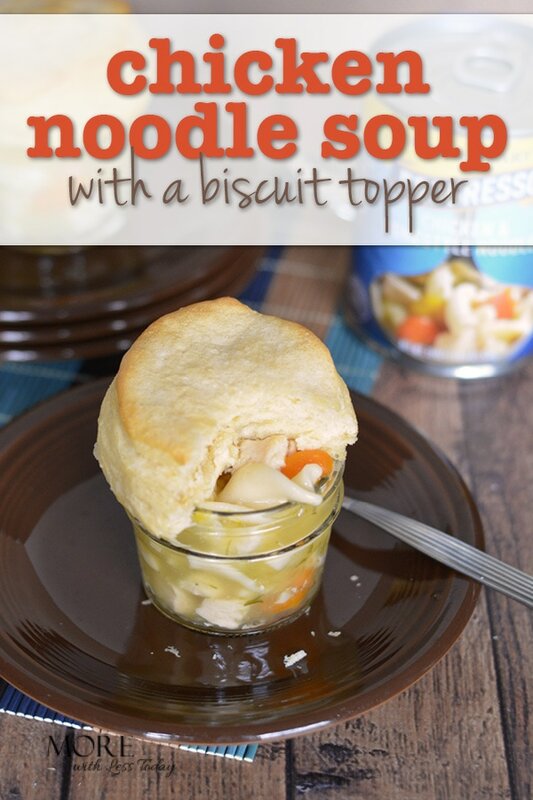 I absolutely LOVE chicken noodle soup but have never made it with a biscuit topper–what a smart idea! Will definitely try it out this Fall and Winter! This is such a cool idea! I love using refrigerated biscuits for the top! Just adorable! This is the perfect combination. I always want something like crackers or bread to dip in my soup! This sounds amazing! However I love biscuits and chicken noodle soup! This looks like a great meal on a cold winters night. I will have to pick up some progresso and biscuits next time I am at the store. This sounds like a great meal on cold winter evenings. It isn’t super cold here yet. I should pick up some Progresso and biscuits. Perfect easy hot meal when you’re away from home on a cold fall day. Really keeps you going. That looks super tasty!!! Perfect meal for a cold day!